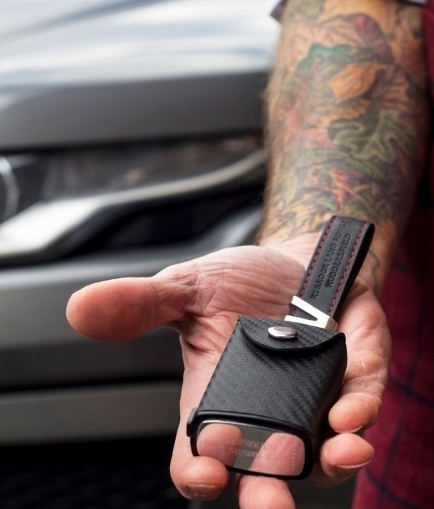 Men’s luxury fashion brand, Vanacci, has launched a stylish solution to the recent rise in car key thefts. The firm’s brand-new product, KeyBlock, uses RFID-blocking technology to prevent thieves from gaining access to a car without a key. Its Kickstarter campaign, which launched early April, has surpassed its campaign goal of £1,000 by more than 300 per cent in 24 hours. New data released in 2019 by the Home Office shows 111,999 vehicles were stolen in the UK in the period 2017-18, up 49 per cent in five years, from 75,308 vehicles in 2013-14. The increase is attributed to the proliferation of keyless cars, which can be started via computer hacking instead of a tradition metal key and ignition switch. KeyBlock is Vanacci’s eleventh Kickstarter campaign and features multi-layered RFID shielding within a modern polymer housing, wrapped in wear-resistant leather. The product includes free personalisation and will instantly upgrade any car key. The design is also made using genuine leathers from Aston Martin, Tesla and BMW. Sean Sykes, co-founder of Vanacci, said: “We’ve been so excited to launch our new product, KeyBlock – it’s one of our most unique inventions. Both our loyal brand followers and our new customers alike, have already provided us with some fantastic feedback. We’re confident that this project will be one of our most successful.